This ewer is based on a 16th-century prototype, such as the example carved with a dragon handle and a floral strut, also from the Hartman Collection, illustrated by Robert Kleiner, op. cit., 1996, no. 52. However, despite the Ming influences, certain elements, like the skilfully carved dragon strut and the sweep of the archaistic chilong motifs, are very much in tune with the elegance and the ornate style of Qing dynasty workmanship. 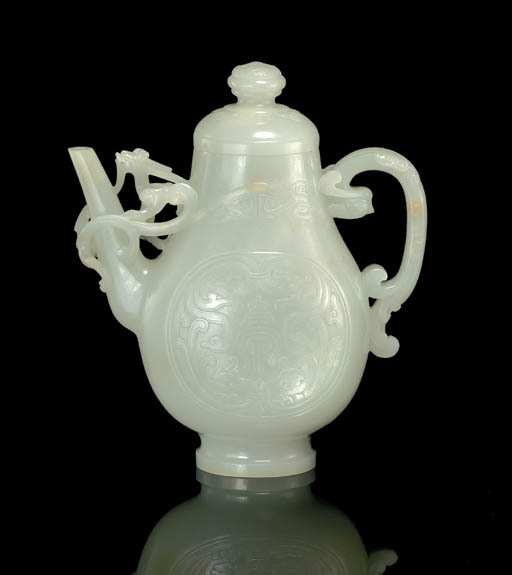 A number of 18th-century jade ewers are carved with dragon and phoenix spouts and handles. The graceful curve of the bodies and the extra embellishment of feathers and long limbs lend interesting shapes and nuances to an otherwise ordinary form. Cf. two comparable covered ewers in the Palace Museum, Beijing, illustrated in Zhongguo Yuqi Quanji, vol. 6, pls. 2 and 3; and an archaistic guang with a dragon handle, a phoenix head below the spout and low-relief zoomorphic scrollwork on the body that is similar in style to that on the present ewer, illustrated in Jadeware (III), The Complete Collection of Treasures of the Palace Museum, Hong Kong, 1995, pl. 136.